This is a humorful cartoon from Punch magazine, 1849. Chateline’s were not really used for children! During Georgian and Victorian times, Chatelaines were considered an essential part of a married woman’s or head housekeeper’s outfit. Since the medieval era, ladies who managed households very often wore one. They were only known as chatelaines after 1830, before that they were known as an ‘equipage’. 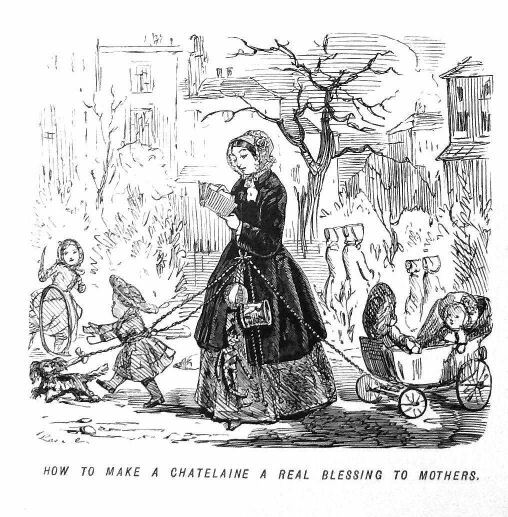 19th century ladies wearing ‘chatelaines’. 1787 print from ‘Le Magain’. This lady is wearing two chatelaines. Essentially, chatelaines were a decorative metal belt accessory which was worn at the waist, usually hung from a chain, from which household tools and practical items were hung. These items, called accessoires, nearly always included keys and could also be such things as a watch, household seal, a scent bottle, a coin purse, a pencil, a locket, a notebook, a pair of scissors, a pincushion, thimble or a sewing needle and thread etc. These accessoires were held in containers called nécessaires or, sometimes, étui. The chatelaine signified the lady’s status as manager of the household and signaled to the servants, if there were any, who was in charge. 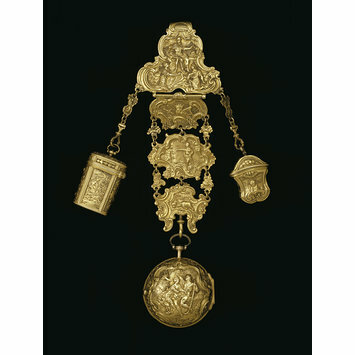 The word ‘chatelaine’ literally means in French ‘mistress of the castle’. But it wasn’t always women who wore then, men did also, with appropriately masculine tools such as knifes and watches attached. 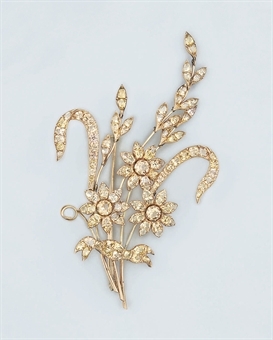 Chatelaines could be made from gold, pinchbeck, silver or silver plate, gilt, copper, stamped metal or cut-steel. Some could be very elaborate with much cannetille, applique and repouse work. Mid 18th century models were often ornately embossed with Rococo scroll work. Sometimes, they had mother of pearl or agate panels. 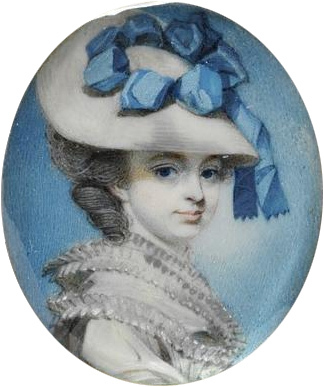 Enameled chatelaines, like this one, were less common. Their role as either ornament or for practical use changed with the years. Towards the late Victorian era they were often worn more for decorative reasons or were even adapted for evening wear, with a place to keep dance cards and a fan. They were even considered a normal part of ‘formal’ wear. The general trend throughout the Victorian era was for chatelaines to become smaller. 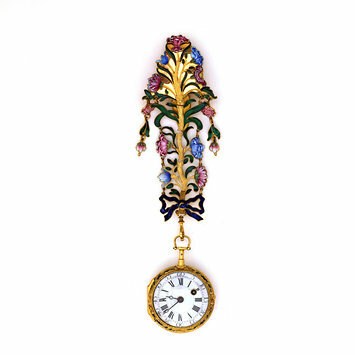 The Art Journal reported the following in 1883: ‘…the long and inconvenient châtelaine, with it’s noisy toys, has shrunk to the dimensions of a watch-chain and swivel, worn at the lady’s waist so as to show outside her dress…’ Chatelaines were still worn as late as the Edwardian era. However, they became to be seen as increasingly old-fashioned and cumbersome until their use finally died out altogether. 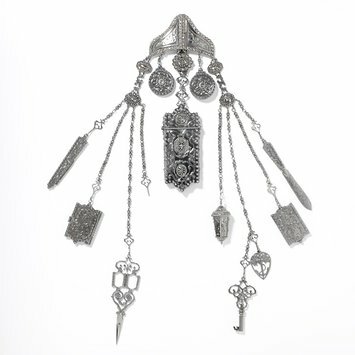 What I find interesting about the chatelaine is how an item that was once so ubiquitous and so much part of the culture could be all but entirely forgotten in the modern day. 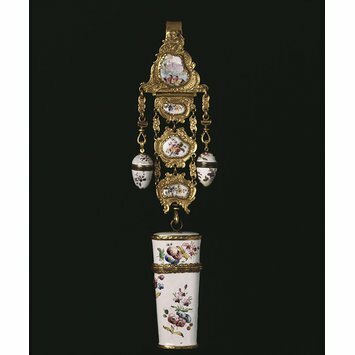 If someone from the Georgian or Victorian era knew that the chatelaine was no longer worn, it would almost be as strange to them as if we traveled into the future and found that the bracelet was no longer worn. It seems as though the decline of the chatelaine is tied in with the movement towards a more youthful and less responsible culture as well as a more streamlined silhouette. Perhaps the desire to be respected, to be seen as a ‘matron’ and someone in charge of a household was replaced with the desire to be seen as carefree, unencumbered and young. 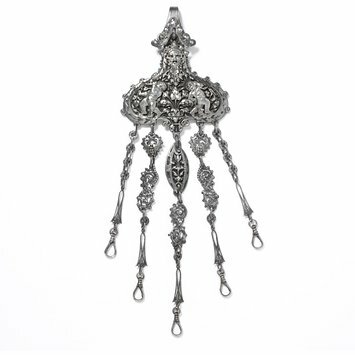 Regardless of the genuine reasons for the end of the chatelaine, they are still fascinating historic and artistic objects that are considered very collectible. Chatelaine, gold cast embossed and chased. 19th century advertisement for chatelaines. With fifty guineas (a great pen’orth!) bought! And both the struggling figures seem to liue. 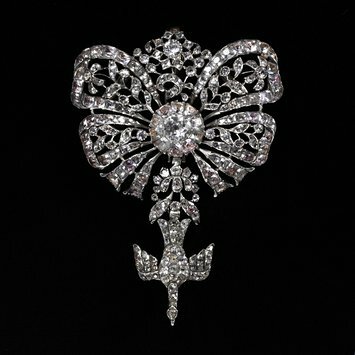 In 1938, there was a brief attempt to bring back the Chatelaine as a brooch. Cameo can be defined as a method of carving which creates a raised or positive design (as opposed to intaglio which is the opposite). 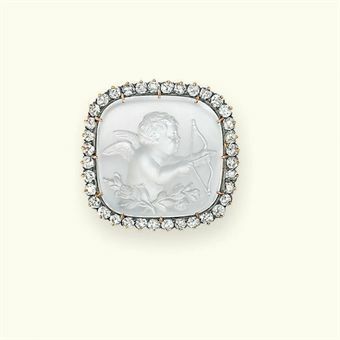 Cameos can be done in stone, gemstone, amber, coral, ivory, bone, lava, glass or shell. Very early cameos (before 1800) were nearly always done in stone, particularly banded agate (also referred to as ‘hardstone’) which creates the contrast in colors between the raised part of the design and the background. Other stones used in cameo are cornelian, malachite, jet, sardonyx and onyx. Black Helmet and Queen’s Conches are the kinds of shells traditionally used for cameo. Italy has long been associated with cameo. A carved shell cameo brooch, the large cameo depicting the winged figure Nyx carring her two sleeping children. The gold frame with Greek key pattern border. Castellani Cameo of Medusa, c.1870. Sapphire. 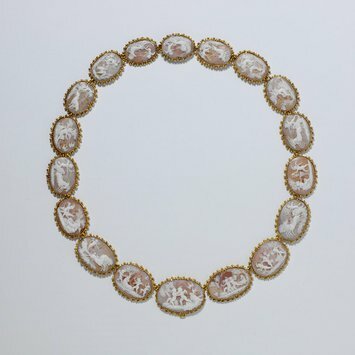 When discussing antique and period jewelry, the term cameo normally implies that there is a contrast in color between the relief portion of the design and the background; however the term cameo is also used to describe this style of carving even when the raised portion and the background are the same color. Cameo carving is an ancient technique which has experienced many revivals throughout the ages. A new interest in cameo came about in the early 1800s, inspired by all the archeological discoveries. 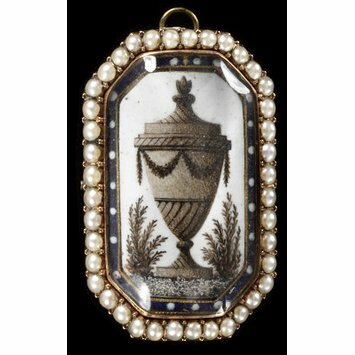 Around 1805, the Pope of the time opened up a new cameo school in Rome and Napoleon I had initiated a ‘Prix de Rome’ to encourage cameo. By the year 1850, cameo had reached a new height of popularity and people flocked to have their portraits, or those of a loved one, carved as a cameo. 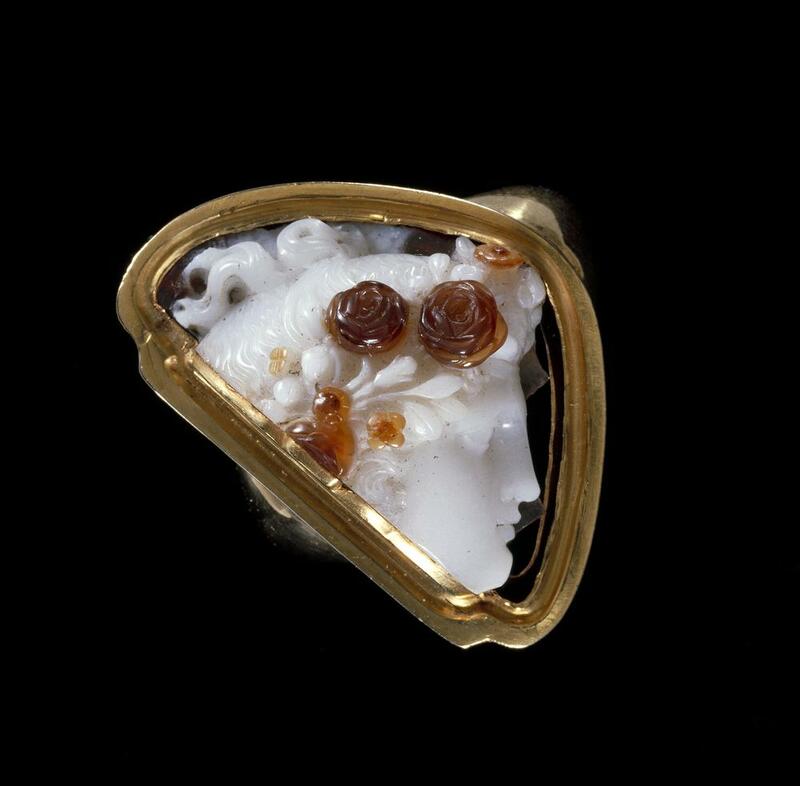 The best cameo artisans came from Italy and when the Victorians went on their Grand Tour, they often brought back these treasures much to the delight of their friends and families back home. Italian cameo artists, often struggling sculptors, soon moved across Europe to open up small businesses to supply the demand. Cameo work was painstaking and slow. A stone cameo could take many months; shell cameos were faster to produce and therefore were less expensive. Neoclassical themes, particularly busts and figures, were very much in style and many cameos of the Victorian era have this motif. 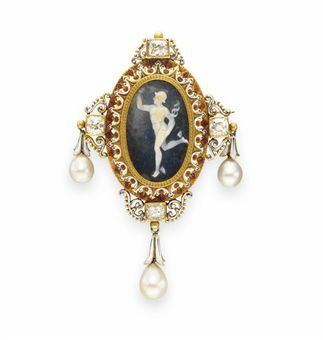 A VICTORIAN MOONSTONE AND DIAMOND CAMEO BROOCH, circa 1890. Cupid with bow and arrow. Fragment of Flora of Pistrucci, early 19th century, Benedetto Pistrucci, The British Museum. This cameo is famous for the controversy surrounding it (click on image above to read more on the British Museum site). Scenic cameos, depicted more than one figure and background details were also popular. Motifs included ‘The Three Graces’ and other classical maidens, often in gardens. By the time 1860 came around, another popular motif was ‘Rebecca at the Well’ which is from a biblical story. Taking different forms, it always comprised a girl, a bridge and a cottage. Other motifs were naturalistic and included flowers and leaves. Commemorative cameos of special events such as weddings were also popular. 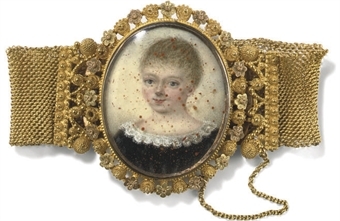 William Tassie, who invented glass paste in the 1760s, began to create molds of cameos and reproduce them in glass. He had an enormous collection of impressions of antique cameos and many credit him with being a key participant in the Neo-Classical revival. These imitation cameos were known as ‘Tassies’ and were popular and inexpensive. This production continued as a family business well into the 1800s. Wedgwood bought many of these molds from William Tassie. Wedgwood produced and still produces jasperware plaques in blue and white which are in the style of cameo and are also often referred to as cameo. In fact, many people will think of these as being the archetype of cameo. However, these are not true cameo as they are made from molds. There were quite inexpensive in their day; they are nowadays considered collectible. A Wedgwood Jasperware cameo brooch late 18th / early 19th century, probably after a design by John Flaxman. 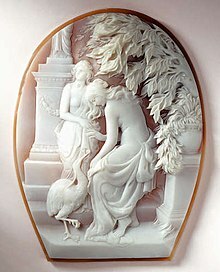 Cameo was also loved by the artisans and designers of the Art Nouveau movement and continued in the Art Deco era. 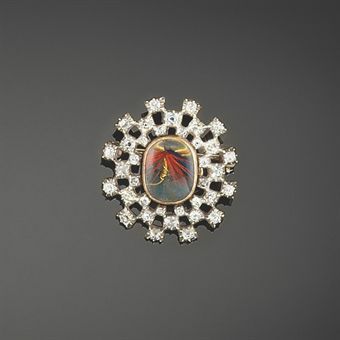 Brooch/pendant with carved opal, demantoid garnet, diamonds, 18k yellow gold, and platinum, c. 1890. 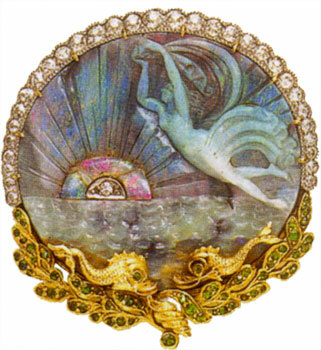 A carved opal depicting a sea nymph with ocean waves by Marcus & Co.
Cameo Brooch, Carved Shell, Art Nouveau era, Maker unknown. 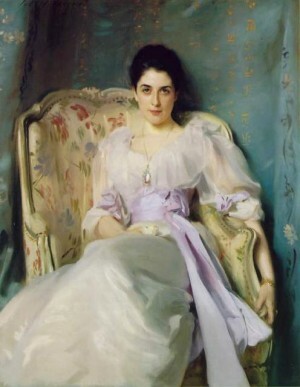 Lady Agnew of Lochnaw, painted by John Sargent in 1892. She is wearing a red and gold cameo pendant. With the advent of Industrialization, many ‘cameos’ could be produced with molds, with dyed agate layers and later with ultrasonic machine carving. (In my opinion, this is why many people today don’t admire cameo or think of them as desirable, they are associating them with the mass-produced, machine made or mold made variety). Cameo continues to be produced and loved today to one degree or another. 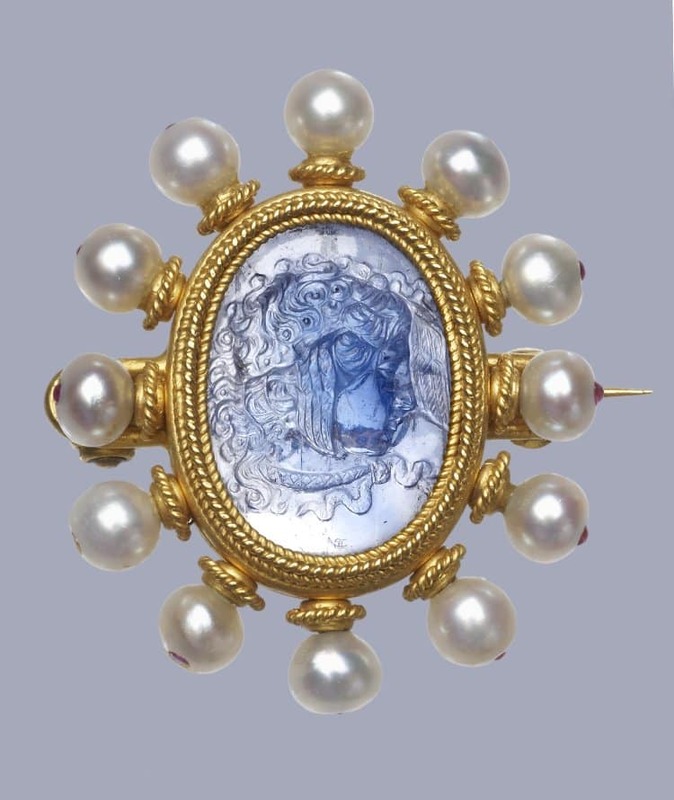 However, the artistry, technique and popularity of cameo that was experienced in earlier eras, particularly in the pre-industrial Georgian and the early and mid Victorian era, (as well as by a few eminent Art Nouveau artists), has not been seen since. There are many clues to look for when dating and valuing cameos and these are just a few below. Having, evaluating cameos is challenging as so many have been remounted and also many cameo artists were really good at copying older styles. Some experts devote their careers to appraising cameos and it requires great skill. I will come back and add more to this list as I learn more. 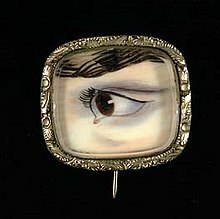 Style: If the cameo features a long Roman nose, the chances are it is from before 1850 and if it has a more pert nose, it is likely to be afterwards. Up-swept hair suggests late Victorian; short hair would imply 20th century. Materials: If it is made from lava, it is almost certainly Victorian. Shells are also not likely to be from before 1800 (shell is translucent when held to the light). If it is jet, it is likely to be mid-Victorian and later. Mounting: If the mounting is made of pinchbeck, it will probably be from between the mid-1700s to mid-1800s. If it is gold electroplated it will be from after 1840. If it is 9k, will be from after 1854. Silver implies it is from the 1880s, but certainly not necessarily so. A safety clasp implies it is from the 20th century. (But take into consideration that it might well have been remounted). Value: Scenic cameos are often considered to be more valuable than simple portraits. Stone is considered more valuable than shell. Obviously, ivory, coral and gemstones are the most valuable. Of course, the mounting is important. Most important of all though is the fineness of the carving; fine detail, flowing lines and grace show skill. Less skilled cameos with be harsher with jagged lines and with less details. Authenticity / method of creation: Things to watch out for are whether or not it is mold made / where it is actually two pieces glued together / laser cut (in which case it is modern) (all of these are best examined with jeweler’s loop). Ultrasonic machine made cameos will have no undercutting and a satin surface texture. There will be absolutely no variation between them and many others of the same design. Dyed agate will show very strong color contrast between the layers. Other: if it is signed it is probably from after the mid-1800s. However, it doesn’t mean that if it isn’t signed it is older than the mid-1800s. Cannetille is considered to be related to filigree or to be a kind of filigree. It differs from filigree in as much as cannetille is three dimensional and filigree is flat. 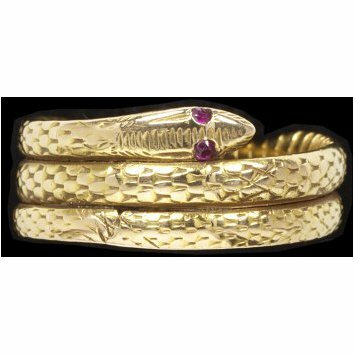 Specifically, cannetille is created with curled, twisted, spiraled, scrolled, beehived or coiled wire. It can also have tendrils and repoussé (places of raised metal). Like filigree, it can either have a backing or be open work. Cannetille is usually gold, although not necessarily. Cannetille appeared to emerge in England and France in the 1820s and continue in popularity into the 1830s. Some say it was inspired by the Portuguese, others by India, others say it appeared to emerge independently in France, then spread to England. 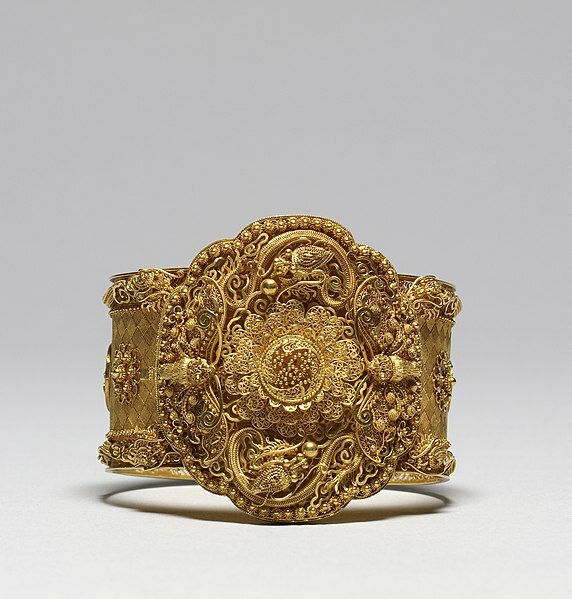 Regardless of origin, cannetille flourished in the period of peace and artistic expression after the Napoleonic wars. The word ‘cannetille’ is also used to describe a type of French embroidery method which has a similar appearance and technique and is created using gold thread. It appears that this is where cannetille jewelry might well have found its inspiration. After the Napoleonic wars gold was very expensive and in short supply. 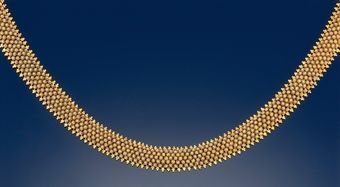 Cannetille jewelry could be created to give the appearance of a much larger piece using less metal. 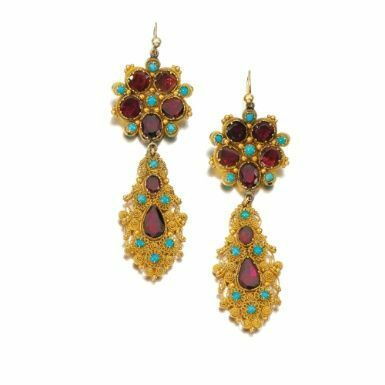 The styles of cannetille jewelry seemed to be nostalgic and reminiscent of many European folk styles which are still made and worn today. 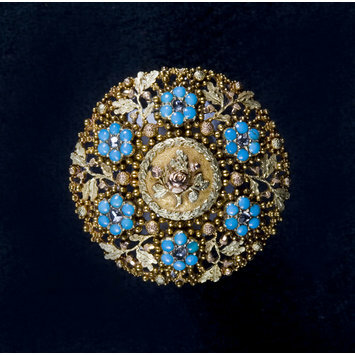 By the 1820s and 1830s cannetille jewelry was being worn all over Europe, reaching a height in 1830. 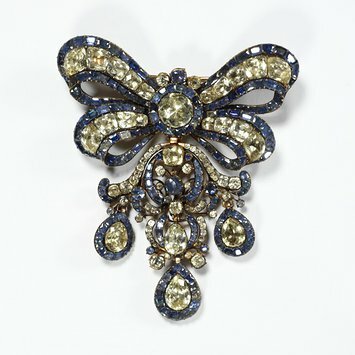 Brooches and parures were the most popular. 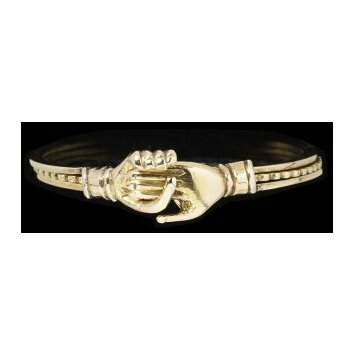 When bracelets were worn, they would be worn one on each wrist, as had been the style for centuries. 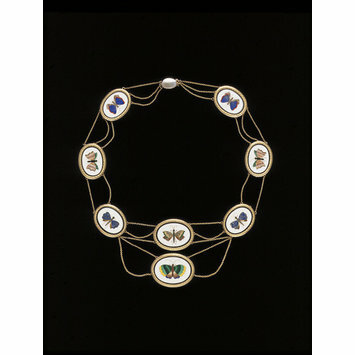 Starting in 1830, Castellini of Rome led an Etruscan and Greek revival in the world of jewelry. Many revival pieces also incorporated cannetille. Greek revival hair ornament with cameo and cannetille. Apollo on his chariot. circa 1830. Cannetille is very time consuming to create and requires great patience from the jeweler. 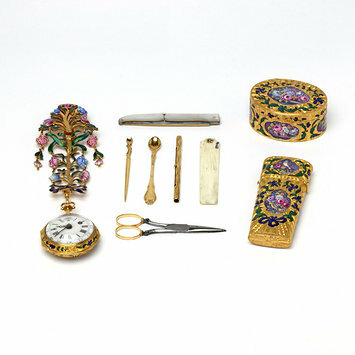 Of course, all Georgian jewelry was made entirely by hand. There are two main methods for creating cannetille: Thread cannetille and plate cannetille. Thread cannetille is when the piece is made entirely from gold threads and has other decorative elements soldered on to it. Thread cannetille is particularly lightweight. Plate cannetille is made from a thin plate, usually open work, and then has decorative elements soldered on to it. Larger pieces tend to be made from plate cannetille. 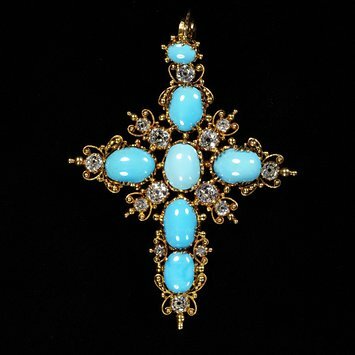 Fine cannetille work with circular-cut and pear-shaped foiled back garnets and cabochon turquoises. 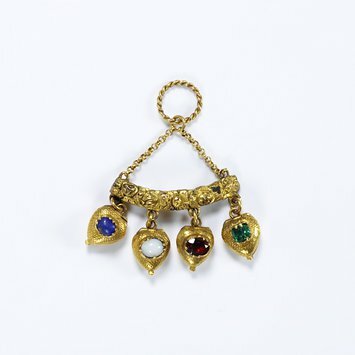 Cannetille in the Georgian era was often set with gems such as pink topaz, citrine, chyrsoberyl, garnet, turquoise aquamarine, amethyst, glass and paste. Glass and paste were considered just as high status as gems and would be set along side them even on the most expensive pieces. Gems in the Georgian era were foiled. 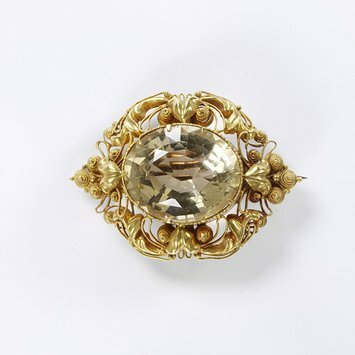 Citrine and gold cannetille brooch, c.1820-1830. V&A Museum. Previously belonging to Jane Morris, wife of William Morris. Cannetille continued into the Victorian era although dwindling in popularity by the end of the mid-Victorian era. 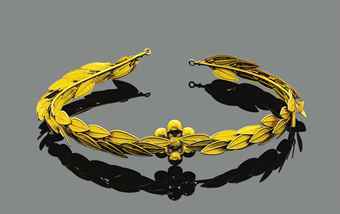 Even though there are some cannetille Art Deco pieces, cannetille never returned to the popularity it experienced in the Georgian era. There are some very convincing cannetille reproductions masquerading as much older than they are so caution is advised when purchasing. 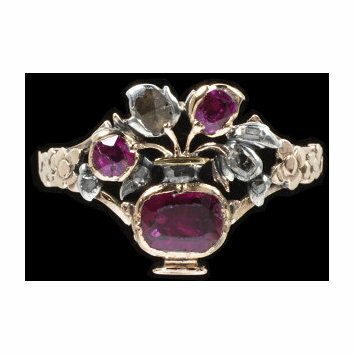 In the Victorian era, cannetille style jewelry was sometimes made in molds by the English; if you exam it very closely with or without a loupe you can generally see that it is made all from one piece of cast metal rather than many fine soldered pieces. Mold made pieces are obviously not as valuable although they can still be desirable. Castellani and Giuliano: Revivalist Jewellers of the Nineteenth Century. Exhibition catalogue. London: Wartski, 1984.